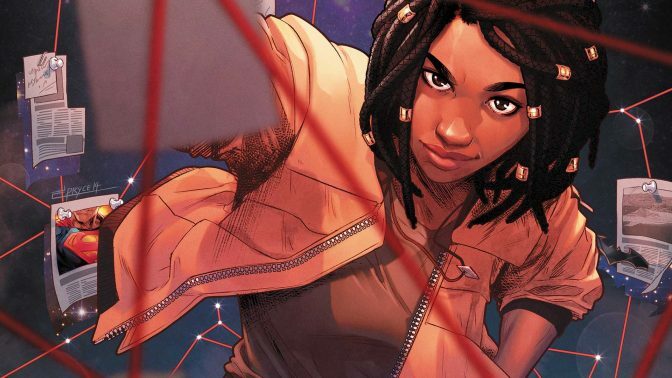 The second series in the new DC Comics imprint Wonder Comics has arrived with Naomi #1. In this book, Superman flies into town fighting Mongul and causes massive destruction before he leaves. Naomi’s friends witness the event but Namoi herself misses it. The next day she sees that Superman is back to help clean up but as soon as she shows up, he leaves again. Naomi is confused as to why Superman showed up in the first place, so she decides to launch an investigation to see if other super powered events have happened in the past. The second series in the new DC Comics imprint Wonder Comics has arrived with Naomi #1. In this book, Superman flies into town fighting Mongul and causes massive destruction before he leaves. Naomi’s friends witness the event but Naomi herself misses it. The next day she sees that Superman is back to help clean up, but as soon as she shows up, he leaves again. Naomi is confused as to why Superman showed up in the first place, so she decides to launch an investigation to see if other super powered events have happened in the past. In this title, Brian Michael Bendis teams up with David F. Walker to tell a pretty solid story that not only delivers the fun but also the mystery. To see these two writers tell a story about a teenager with a mysterious past who is trying to live a normal life in the DC Universe is pretty interesting. As I was reading this, I kept thinking about other series like this such as Gotham Central; where the superheroes are moved to the background in favor of a more grounded character. It’s interesting to see Naomi pick up on the things that are wrong in the town and try to get to the bottom of it while also juggling her relationships. The reader doesn’t know if she has abilities, and that makes the mystery even more interesting. There was one negative takeaway with this issue though, that being the citizens of the town. As I was reading I found that the citizens were either too friendly or too rude and they were hiding something. It felt too convenient and it took me out of things a bit. Maybe issue 2 will improve upon this. The art by Jamal Campbell is absolutely beautiful and is (to my mind) the strongest aspect of this book. When it comes to art, this book has it all. It may not have a lot of action but it makes up for that with the tone. The book has a fun look with serious undertones which really help set up and drive the story that Bendis and Walker are telling. Campbell also makes Naomi’s hometown look so unique that it actually becomes a character in the story. The destruction that the town suffered made me feel for the various citizens who were affected, which just added to the immersion in this title. Finally, it’s worth mentioning that this is the best that Superman has looked in a while and I enjoyed the Campbell’s take on the costume. It’s the combination of all of these things that show that Jamal Campbell is a solid choice for this series. At the end of the day, I enjoyed this book and have liked these first to series from the Wonder imprint. I’m definitely looking forward to more.